There is scarcely anyone unaware of the ultimate to do list manager. It is not a software. It is not a web based app. 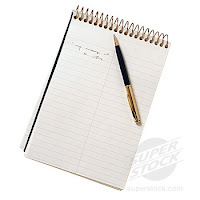 It is the age old, evergreen, ultimate productivity tool called 'pen and paper'. Whereas it is paper that is used usually, I would suggest using a stack of small rectangular papers, single lined and bound using a clip - a reminder pad. Extreme portability: A standard reminder pad is designed so as to exactly fit into your pocket. Quick, lightning quick: No booting required, no saving, no backing up. Simple: Take any web based app, you will have to log in to access your tasks and that is an added disadvantage. Well, once you've started using it, you will find that unlike when you start with the web based apps or any software, you don't give up writing your tasks after the initial enthusiasm ends up. It's such a simple yet effective tool that you'll soon get addicted to it. And what more, you'll soon be able to live in the present. ?? but how do I find my pen ?? I am not commenting to your post-power of pen and paper. But commenting to ur comments to my latest post.